Build your legion of minions with McDonald's Happy Meal! 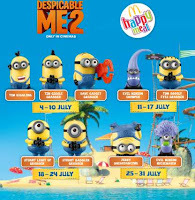 Starting from 4th of July, there will be a series of Despicable Me's minion toys released every week for the next 4 week! 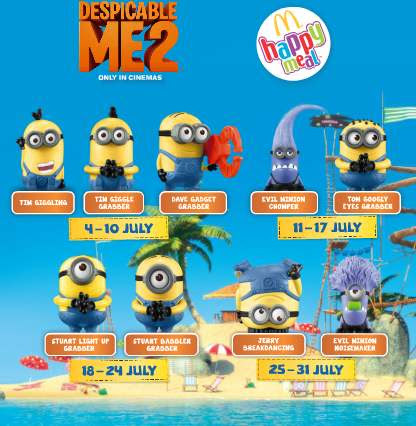 A total of 9 minions are released for the Malaysia McDonald's Happy Meal edition. · This promotion is ONLY for FRONT COUNTER and DRIVE-THRU customers and will not be available via McDelivery (McDelivery 1300-13-1300 and Web Ordering Service). · Limited to 2 sets of Happy Meals per customer per receipt, available while stocks last. · Numbered coupons will be distributed starting Thursday, 25 July 2013 from 12.00 midnight onwards for 24-hour McDonald’s restaurants. · For the rest of our restaurants, the numbered coupons will be available at the start of its business hour on Thursday, 25 July 2013. · We’re pleased to offer you the option of donating your Happy Meal(s) excluding the toy to local charity homes. All you have to do is indicate at the numbered coupons whether you’d like to donate or keep your Happy Meal(s). More details pertaining to the donation to the local charity homes will be posted on our website and Facebook fan page next week. We regret any inconvenience caused. Thank you for your support and understanding. LIKE & SHARE out this minion love! Authentic Despicable Me Minion Dave Talking Action Figure. Now for only RM99 instead of RM259! Free Delivery within Peninsula Malaysia!